Our camp near Winston-Salem, Tanglewood Park, has proven to be a great choice for this week. This is a former Reynolds estate (we’re in tobacco country now, hence the familiar names Reynolds, Winston, Salem) turned into a large county park. 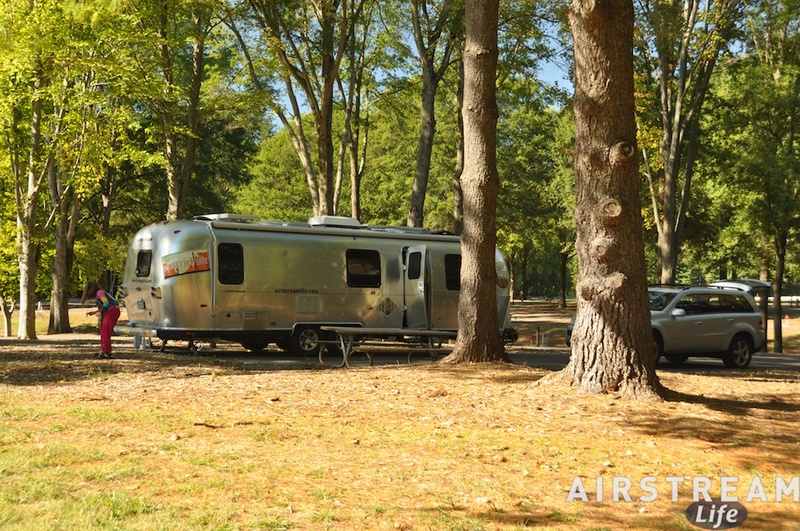 Tanglewood includes a golf course, inn, stables, gardens, tennis courts, and two lakes — and recently, an RV campground. Since we’re here during the week and off-season, the park is nearly empty. Other than the three camp hosts, I see only four other rigs camped here in the 44 available sites. Over the years I’ve often posted praise about various places we’ve camped, but it feels to me that I should probably share the information a little more broadly. RVParkReviews.com has been a useful tool to us when trying to find a place to stay, so I’m starting to post reviews there of places we’ve visited. I wouldn’t have found Tanglewood without that handy website. So instead of discussing campgrounds in detail here, in the future I’ll post a link to my review. Since this is a working stop, our explorations have been limited. I’ve been locked up in the Airstream all day, every day, working at the computer and making phone calls. I’ve been starting before dawn just because there’s so much to do that I can’t sleep in. When we make a “working stop” like this I am usually rushing to do two weeks’ worth of work in 3-4 days, which is stressful but it’s what makes the extended “fun stops” possible. Eleanor and Emma typically find something to do to get out of the trailer for at least part of the time, even if it’s just some homeschooling while the clothes spin at a nearby laundromat. But we did find some time late yesterday afternoon to break out. Not having researched the area at all, we asked the GPS to suggest an Attraction and it said “Old Salem.” That turned out to be an awesome find: a five-by-two block collection of fantastic old houses and buildings, plus a good visitors center and museum. It’s a cross between a living history museum and an old city quarter — some houses are private residences and others are open to the public with live demonstrations. We arrived too late for anything to be open but that turned out to be a fine thing: we were alone on the street as we walked the brick sidewalks in the perfectly clear and crisp fall weather. Our mail drop included a replacement Kindle for Emma, courtesy of our friend Joe, who was kind enough to offer Emma his at a reduced price. She’s happily back to reading on it. The nice thing about the Kindle is that all of the books on the lost device are easily retrieved. One of the tricky tasks this week has been re-scheduling. As long-time blog readers know, I hate making reservations. Having reservations means we have no flexibility, and flexibility is one of the key freedoms that traveling this way is supposed to allow. But sometimes there is no choice. State parks have become much more popular since the recession hit, so we have to look ahead to weekends and make sure that we aren’t going to get shut out for the places we want to visit. We’re heading into peak season in Florida, so the great state parks with camping — like Anastasia, Blue Spring, any of the parks on the Keys, Oscar Scherer, Jonathan Dickinson, etc, etc. (there are LOT of great parks in Florida) — will require reservations on weekends in October. The other complicating factor is that we are cheapskates, and so we do a lot of courtesy parking with friends. It’s not fair to our friends to say “we’re coming, but we won’t tell you when until just a couple of days before,” so we try to set dates and stick to them. But sometimes things change. In this case, I realized that I need to go to the Lake Mirror Classic Auto Festival in Lakeland FL, October 15-17, and that has drastically altered our original plan for Florida. We were going to slide down the Atlantic Coast to the Keys, then return up the Gulf Coast, but now we are going to do something more like a figure-8. That change has forced a flurry of calls and emails to people we were going to see. The logistics involved took hours of research, emails, and fiddling with the calendar. Our strategy is to reserve only on weekends, and leave the weekdays roughly planned but open to possible changes. I think we have it hammered out now, and the end result is really a better plan than we had originally, so we should have a good time. We are going to be in Florida for nearly a month and see a lot of Florida friends: Dave & Becky, Bill & Wendimere, Brett & Lisa, Pierre, Alice & Tim, plus a nephew in Miami, a niece in Gainesville, and Mickey Mouse. On the ideal trip, it feels great to be heading toward your destination in the wilderness, and it feels great to be heading back out to civilization. That means you’ve gotten your fill of change and perspective, and hopefully are more appreciative of everything you’ve got in life. That’s how I feel about our past few days in Shenandoah National Park. We could hardly have had worse weather coming into the park. The big rain that everyone was talking about (see comments on the previous blog entry) hit the Washington DC area as we left, and we towed the 95 miles up to the mountains in a moderate rain, with fog along the top of the Shenandoahs obscuring all of the views along Skyline Drive. All we could see were waterfalls splashing down the exposed rock along the edge of the roadway. This is the sort of weather that tells you if you have a leak in your rig; fortunately we did not. 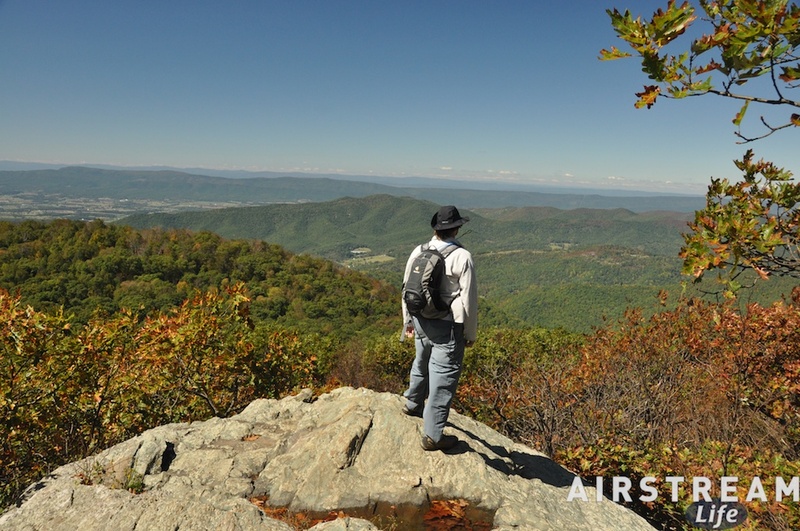 We were expected by friends who had already been at Shenandoah for over two weeks. 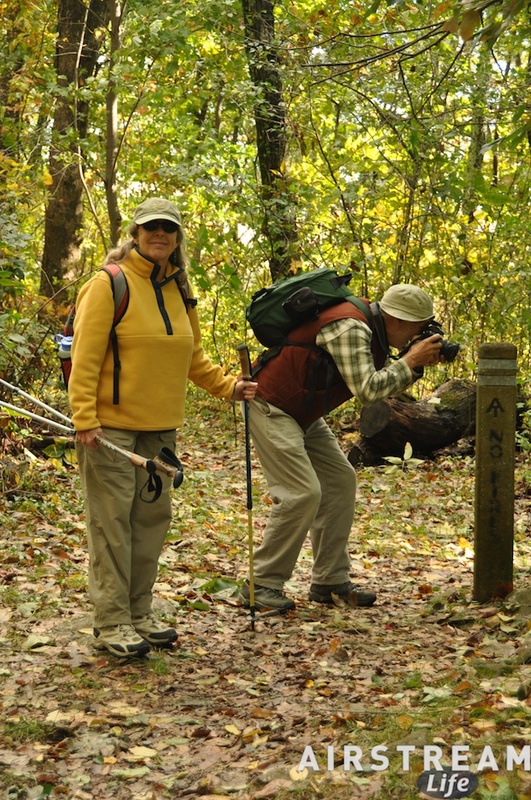 Bert & Janie Gildart were there, working on the fourth edition of their popular guide to Shenandoah National Park (published by Globe Pequot Press), and they’d been joined by Adam and Susan, who were hiking the trails with the Gildarts. To update the book, Bert needed to hike every trail again, take new photos, and capture GPS coordinates of all the trailheads. Everyone was out when we arrived, so we hit the Visitor Center first, to get oriented and get Emma’s Junior Ranger program. 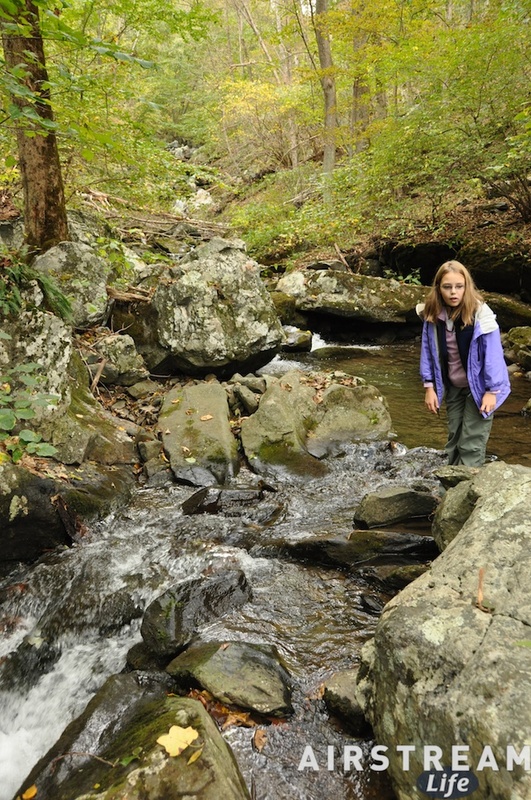 The Jr. Ranger badge for Shenandoah is a tough one, requiring the purchase of a $3 workbook and completion of 12 activities plus attendance at two ranger programs. It ended up taking all four days for Emma to complete. The Visitor Center at Big Meadows tells a very compelling story of the formation of the park, focused on the political and cultural struggles that surrounded it. During the Great Depression, when the park was approved, the land was occupied by tenant farmers and homesteaders, most of whom were relocated, and there was quite a bit of travail associated with that. There’s also a story surrounding the contribution of the Civilian Conservation Corps, whose signature stonework and architecture are visible everywhere. The pouring rain and fog reminded me of our visit to the Hoh Rain Forest in October 2007. On that trip Eleanor made an apple crisp, and coincidentally she made an apple pie while we were in Shenandoah. There’s something about baking in the Airstream on a cool rainy afternoon that makes it feel very cozy. Unlike our trip to the Hoh, we were also comforted by our catalytic heater, which really paid off on this trip. There are no hookups in the Big Meadows campground, so we were operating solely off solar power and batteries. I like the smooth, silent, radiant heat the catalytic heater produces without needing electricity, and its high efficiency. We ran it each night as the temperatures dipped into the low 40s. Our friends were admiring it as well, since they were going without heat on some nights in order to budget their power. The generator hours in this campground weren’t really enough for them to recharge their batteries fully if they used their furnace extensively. Fortunately the weather turned beautifully sunny on Friday and stayed that way all weekend. Shenandoah runs about 10 degrees cooler than the valley below, which meant perfect fall hiking weather in the 60s each day. The rain took a lot of leaves down, but there were still plenty to show some early fall foliage color, and the air was sparkling clear for stunning vistas both east and west. 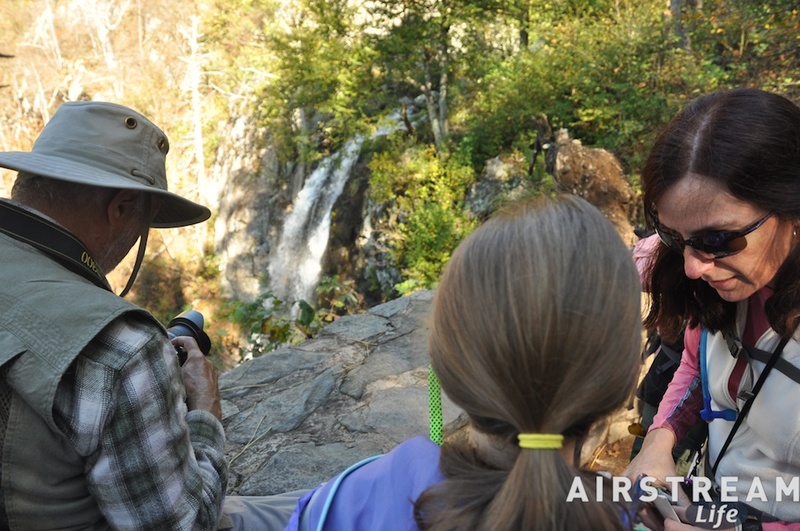 I did two short hikes on Friday morning with Bert, Adam, and Susan, and in the afternoon we picked up Janie, Eleanor and Emma for a 3.3 mile hike to Lewis Spring Falls. Emma and I celebrated the day by trying the chocolate shakes at Wayside, the cafe and store at Big Meadows. 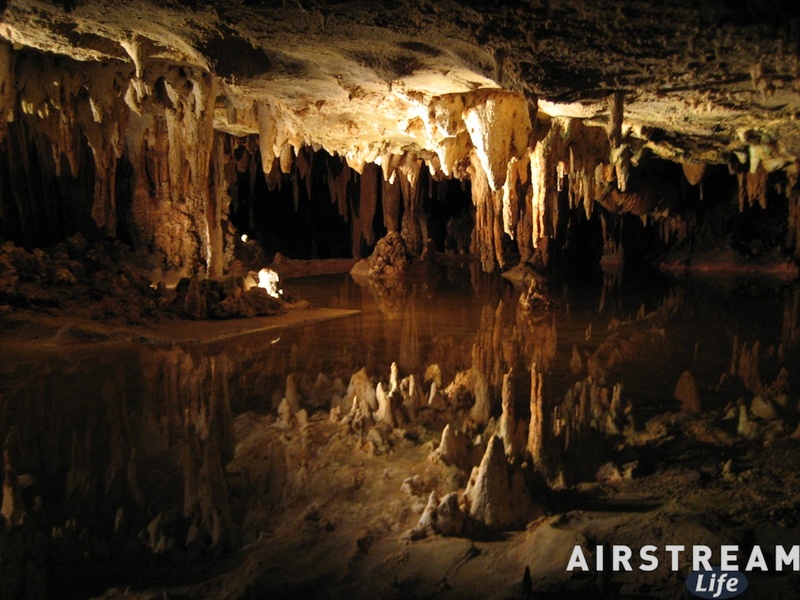 We chose to take the day in Luray, down in the valley below, to get some extra propane and diesel, and to visit the famous Luray Caverns. The caverns are bigger than I remembered, much more sophisticated (now with an audio tour) and much more expensive at $23 per adult. 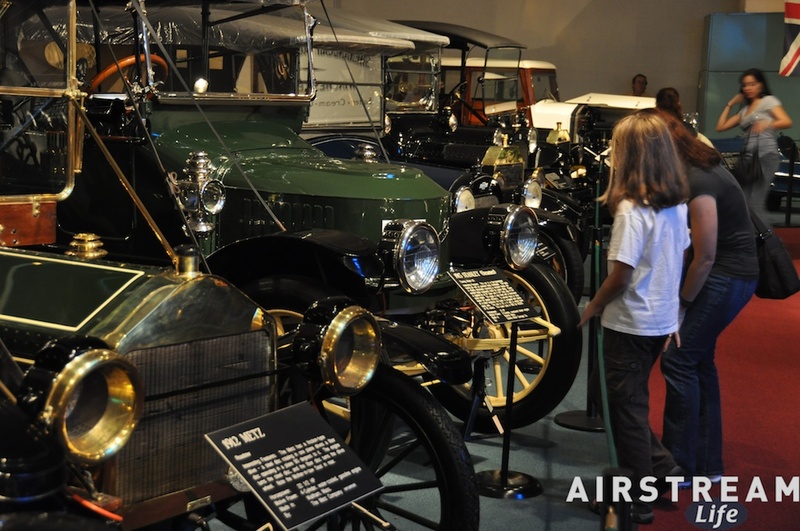 But the ticket includes admission to two other small museums on site, one filled with antique cars, the other filled with Shenandoah valley historical objects. The result is a solid two to three hour visit. This time we had the chance to actually see things as we covered the 15 miles or so of Skyline Drive from Thornton Gap to Big Meadows, so we stopped at every overlook along the way. Several were closed for renovations, with signs that say “Your Recovery Dollars At Work”, but there were enough spots open to get a really nice look at both the eastern and western valleys. Back at camp, things were smokier than ever, and we had to peer through a haze to see the ranger’s presentation that night, but we knew it was the last night we’d have to endure camping in the midst of a forest fire. Sunday’s hike amounted to 5.5 miles roundtrip to South River Falls, in 46-52 degree temperatures. Eleanor and Janie stopped at the falls overlook while the rest of us continued down to the base of the falls. It turned out to be a good call for those of us who went down, because we spotted a bear cub along the way. Momma Bear was nowhere in sight, but I’d guess she was in the direction we saw the cub running. Since we were budgeting our water in the Airstream very carefully in order to get four nights of use out of our 39-gallon supply, I volunteered to take a shower far up the hill at the campground’s shower/laundry area. It was far enough up the hill that I drove the car over, with my towel and soap. The deal was $1 (four quarters) for five minutes of water in an unheated shower cubicle. Since the time limit wasn’t actually posted at the showers I used, I guessed how much water I had left—and I guessed wrong. Unlike a car wash, there was no “beep beep beep” to warn of the impending end of water. It just suddenly slammed off, and I was left with a significant portion of soap on my body. There is no negotiating with these machines. The only thing they care about is four more quarters, which I did not have. I needed 30 seconds of water but you can’t get sympathy from a coin-op machine, so I wiped off most of the remaining soap, dressed, and drove the car back down to the Airstream where the rinsing was completed. Solar-wise, we did well. The first day was a washout, and the last day (Monday) was a washout, but the other three days were very sunny. Every day we were fully recharged by afternoon. We left the park on Monday morning in an extremely heavy fog with 75% of our battery power remaining. 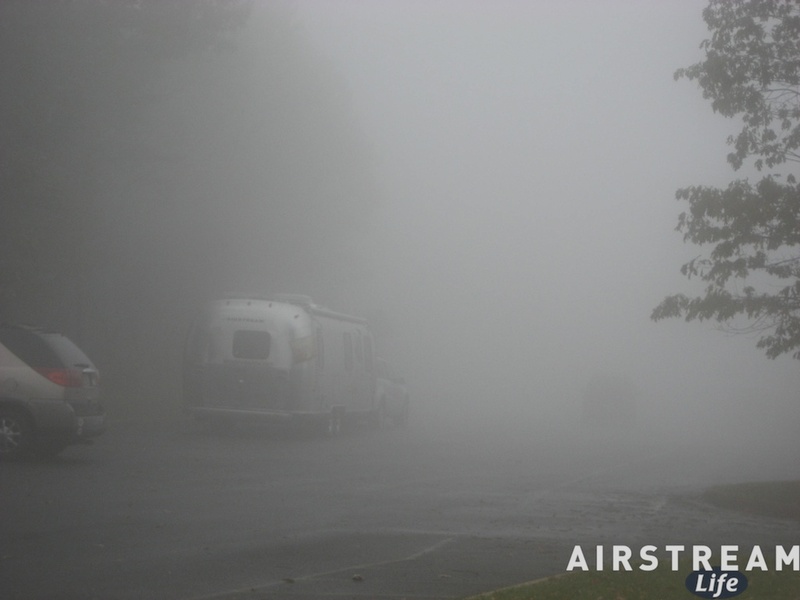 We had planned to leave on Monday, but even if we hadn’t it was definitely time to go: the weather was abominable, with wind, light rain, dense fog, and temperatures hovering around 40. Adam and Susan left as well, but Bert and Janie will be there another week or two to complete work on their book. Emma was concerned about towing in the grim weather. The fog was so dense that deer could not see us coming, and would jump out into the road with no warning. The speed limit on Skyline Drive is 35 MPH, but we covered about 15 miles of that twisting and hilly road at a very sedate 25 MPH, carefully studying the trees as they appeared from the gloom for signs of deer. Two passed right in front of us but we were going slowly enough to stop. I posted some video showing just how spooky this tow was, on YouTube. We are now near Winston-Salem NC in a pleasant county park. It is Fall even here, but much warmer and fairer. For the next four days we will be engaged mostly in work and school since this is a spot with conveniences such as cell phone service. Our immediate plans from here are vague, but generally we are headed to Florida where various appointments await. For the next two weeks, we are mostly free to roam between here and there.